If all goes as planned here on Spontaneous Lunacy we’ll be reviewing tens of thousands, if not hundreds of thousands (millions???) of songs over rock’s historical trajectory, now 70 years and counting. Alongside the huge hits will be plenty of obscure curios so it’s highly doubtful that all of these songs will be familiar to whoever stumbles across the blog. More likely, and in fact more preferable even, is that a majority of the titles and those performing them will be relatively unknown to most and as such these reviews will be the first exposure many will have to songs that would otherwise have fallen through the cracks of rock history. Some of those records, upon reading about and hearing them, you surely will say weren’t really missed by anyone in the years since they vanished from sight and as evidenced with the scores I’ll hand out in many cases I’ll agree (though that doesn’t mean they don’t deserve re-examination). But every so often there’ll be songs you never knew existed that will leap out at you, seizing your attention and capturing your heart and you’ll wonder how on earth you ever lived without them. No doubt these will be different songs for different people, what connects with one will go right over the head of another. But that’s GOOD, as it will show the diversity of tastes is what prevents music from ever becoming homogeneous. The point here is simply to expose the songs that might connect with any one of you and let each person come to their own conclusion. The scores given on the pages only reflect what connected, or conversely failed to connect, with me. I’ll try and explain why I came to the decision I did and maybe in a way convince you to hear something that I hear in them, good or bad, but ultimately what matters is not what I hear, it’s what YOU hear. I just want you to be able to hear it all and be open-minded enough going in to each record to be interested in what’s presented to decide for yourself. But if you need an early example along the way to convince you of this project’s intent, that exposure and contemplation leads to a greater appreciation for ALL music, and that doing so gives you a far better chance to be transformed by what you uncover, look no further than The Rain Is Falling and the sadly fading recognition of the artist who cut it, Albennie Jones. The first sound you hear is Billy Butler’s guitar, haunting, distant and sounding almost as if you tuned in to the wrong station… maybe a muted Chuck Berry intro from 1958, or even a dry run through a Rolling Stones riff from 1972. That sensation quickly fades as it adapts more of a mellow jazzy-blues feel fit for the year 1947, though there are times in the song where you’d swear he was a time traveler. But it’s only your imagination, as he’s essentially playing variations of the same thing throughout, a nice single string descending run to add color to the melancholy blues-rock ballad. It’s just that the type of line he plays would remain more or less a constant in rock’s endless future, showing that one of the cornerstones of rock music was indeed present from the very beginning. It’s simply timeless. But everything else about it rests comfortably in its own time, where Albennie Jones (her birth name was Albinia in case you’re wondering) became the first female rock vocalist of note with a soulful lead on a slow grind of an emotional ringer. This is rock’s first torch ballad and it set the bar about as high as it gets, daring anyone to follow in that style to try and match this, let alone try and surpass it. Albennie Jones never reached the mountaintop of musical acclaim. In fact, she never scored a hit, though she recorded steadily for a number of years for some big labels and with stellar supporting players, so it’s not as if her talents went unrecognized by those in the know, but that elusive and all too often fleeting connection with the public never transpired. The one break along the way she needed in order to make her a household name remained tantalizingly out of reach her whole career. Like a flower blooming on the far side of a jagged cliff or a spectacular sunrise over a barren desert, Jones’s brilliance was continually passed over by the public. Those alive over the past seventy years who missed out on her should never live that down. In a way though her lack of widespread acclaim is understandable simply due to her particular skill set. The Rain Is Falling is truly a virtuoso performance, yet one that’s almost sure to be overlooked – even now – as she imparts this purely sexual come-on with such nuance and subtlety that it can take multiple listens to realize the absolute perfection of her delivery. Each breath, each tone, each inflection seems chosen from a deep arsenal of emotions that Jones possesses and she never once chooses wrong. Despite her pleas for fulfillment it never crosses much further into dirty territory, which I’m sure comes as a disappointment to those who want salacious lyrics and double entendres galore in their music. But rest assured there’ll be plenty of songs that will fill that void soon enough. In the meantime this doesn’t need tawdry sensationalism to deliver the goods because what Jones offers instead is genuine gut-wrenching emotion that increases dramatically as the song progresses. If imagination isn’t your forte rest assured you won’t need it much here, her carnal desire is palpable in each line she sings provided you simply listen intently to every word and their inflections. Her voice swells at times, as her anticipation for seeing him grows and when she realizes he’s not there it drops into a throaty moan of anguish. She positively whines on the word “Pleeeeease” as she begs for her guy to take her home with him, casting her as a rather immoral chippy, but then seconds later her voice drips with scorn as she tosses off an insult to the girls (prostitutes or gold diggers, it doesn’t matter which) who are merely looking for money in exchange for a roll in the hay with no thought as to the emotional and sensual need she – and by extension they – should crave from such an experience. Because there’s no artificial emphasis on the bawdy undertones for shock value purposes and since it’s lacking a rousing musical punch or clear-cut hook to make you stop in your tracks you really need to scrutinize the lyrics and corresponding delivery from start to finish to absorb its immense power. If your mind wanders for so much as a second it’s just as likely that the entire mood could slip away with it, just as if you glance at the girl across the room a second too late you’re sure to miss the alluring look she casts in your direction and as a result you’ll wind up going home alone that night yourself. This is a record that insists on total concentration but its payoff for those who comply with that demand will be rewarding. Yet its tenuous nature is also a virtue, for there’s not a single moment of this that could be improved upon, other than the fidelity, which by modern standards is subpar, but certainly not unlistenable by any means. Maybe it’s something that is just too intense to fit seamlessly in a playlist of these earliest rock sides (and yes, that’s a definite suggestion to check out our monthly playlists of these songs we’re reviewing, listening to them until they’re branded on your consciousness), where each song flies by all too fast for you to really focus on any one for too long. But that’s also what makes it special. Once it gets its hooks in you it noticeably stands out as something beyond just a record made for the transient listening pleasure of a nameless, faceless audience on the run, but instead almost seems like documentation of an actual event, a display of human emotions overwhelming in its power. For at no point during this do you get the sense what she is singing is anything but completely authentic. Realistic circumstances surrounding the scheduled recording of a written song be damned, I’d never believe that Jones wasn’t feeling every word of this in her heart… as well as in her loins. It simply seems too real to be anything she had time to put down on paper because sentiments like this, delivered with such aching urgency, could only have been ripped from her soul. 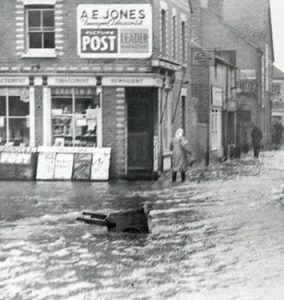 The Rain Is Falling has all of the hallmarks of true romantic anguish, the kind that is messy and disquieting, best suffered through behind closed doors where such naked emotions don’t need to be reined in for public approval. But on those rare occasions when such torment gets revealed without any concern for who may be listening, voyeuristic though it may be to enjoy, it is absolutely riveting every time. This is one I never saw coming until it left me flattened in its tracks after multiple spins, each time hearing it causing me to focus even more intently on every passage, gradually pulling me under its spell until I was utterly transfixed. Maybe it won’t knock you over in quite the same way, and that’s okay, but rest assured something else to come down the road will have the same effect on you – the lightning bolt out of the sky every music fan should eagerly anticipate and wait for no matter how long it takes to strike. Whatever record that does connect with you in this way will hopefully be proof enough that the effort being made here to listen to every song with an open mind is something that will pay dividends for everybody before long. 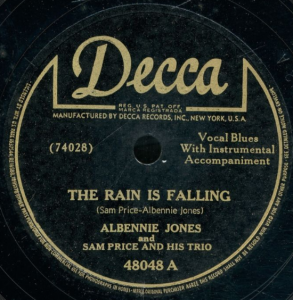 Leave a reply on "Albennie Jones: “The Rain Is Falling”"